Perhaps you’ve seen them… those insulating jackets for wrapping around a hot water tank to reduce heat loss. Do they work? Yup. Are they worth it? Maybe. But can you do better? Definitely. In this article I want to demonstrate that it usually makes sense to add MUCH more insulation around a hot water tank than you might otherwise think. Is there such a thing as too much insulation? If so, how much is too much? Yes, there is, and it can be defined as follows: If adding more insulation costs you more than it saves you over a tolerable payback period then it’s too much insulation. You can think of “cost” in terms of dollars or in terms of environmental footprint depending what your concerns are. Assuming you’re primarily interested in saving money, it’s fairly easy to estimate what you can save by adding more insulation to a hot water tank. A typical electric hot water tank may consume around 250W of continuous power on average. Over one year that amounts to 2190 kWh of energy. Where I live electricity costs about $0.07 per kWh so a typical electric water heater with no additional insulation might cost about $150 per year to operate. Depending on use, perhaps $50 of this is actually used to raise the temperature of the incoming cold water. The remaining $100 is wasted in the form of heat dissipation to the surroundings. A typical electric hot water tank may have about 5cm thickness of fiberglass insulation built-in. Assuming you will be insulating the outside of the tank with a similar material, the power consumption to maintain a given tank temperature will be inversely proportional to the total insulation thickness. So if you add another 5cm of insulation, doubling the total thickness, you will half the cost per year to maintain the tank at temperature. With a little math, it’s not difficult to figure out how much insulation can be added to achieve payback within a certain number of years. What we want to know is the maximum insulation thickness F that will payback within Y years? This is the thickness at which the cost of the insulation exactly equals the savings in the the first Y years (ignoring the cost of your own labor). So if you want payback within 1 year, you can splurge on up to 25*1-5 = 20 cm of insulation (about 8″ thick). Add any more than that and your costs would exceed your savings in the first year. 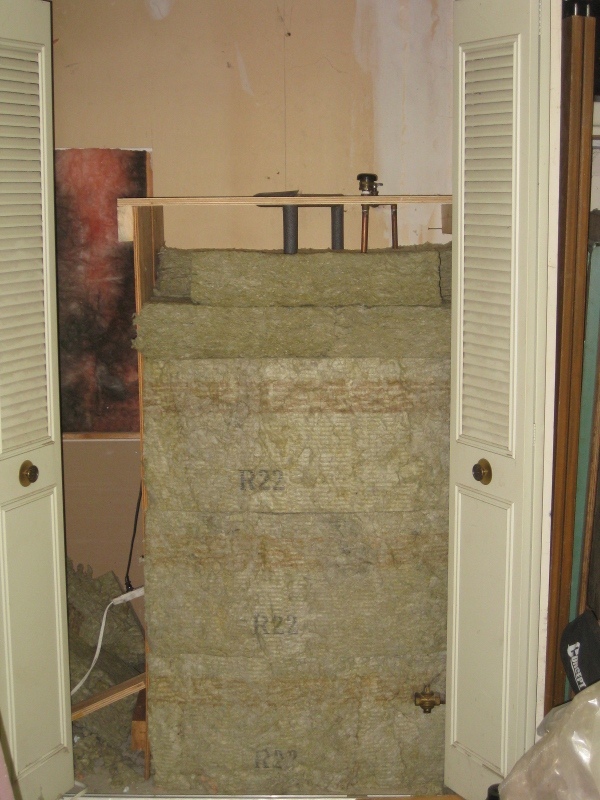 If you can tolerate payback within 2 years, add up to 25*2-5 = 45 cm of insulation (about 18″ thick). Does this seem like a lot? It certainly is when you consider most water heater blankets sold for the purpose are only around 4 or 5 cm thick (2″) at best. But it makes sense. Essentially what it means is that adding insulation is cheap compared to the cost of wasted heat. Given that a 4 or 5 year payback isn’t unreasonable this analysis seems to indicate that for all intents and purposes there basically is no such thing as too much insulation for a hot water tank. It makes economic sense to fill ALL the available space around a hot water tank with insulation. If your hot water tank is located in a heated area of your home, then during your heating season, the heat dissipated from your tank is not wasted. It heats your home. You will pay for the same amount of heat whether it is produced by your hot water tank or your heating system. Therefore, when you calculate A above, you should only consider the period of the year that you are not heating your home. My hot water tank is located in an unheated garage, so any heat it dissipates is wasted regardless of whether I’m currently heating my home. If you have a gas hot water tank with a continuous pilot flame and an open flue, your savings from insulating will be much less than predicted above. This is because the main source of heat loss in such a tank is not through the outside walls of the tank but up the chimney. I converted my gas hot water tank to electric both because I wanted to reduce heat loss up the chimney and because I wanted to run the tank on a timer. A side benefit of the modification was that I could benefit more from super insulating the tank. To simplify the calculations, I ignored interest. Including interest would decrease the calculated thickness for any given payback period. The longer the period, the greater the discrepancy. However, even with a 4 year payback period, the error is probably only around 10%. I purchased a batt of Roxul insulation for about $35. This is about the same price as some insulating blankets designed specifically for hot water tanks, but it is enough for about 12″ of insulation around my tank which is more than 5 times what you would get with an insulating blanket. The images below sho before during and after insulating my hot water tank. Warning! It’s best practice to use only non-flammable materials for insulating any heating appliance. 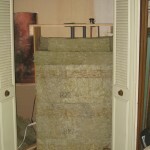 Fiberglass or rock wool batts like those used for insulating walls are a good choice. Sleeping bags, quilts, newspaper, etc are not. Although these images show what appears to be a gas hot water tank, I must emphasize that it is not. A gas hot water tank cannot be insulated on all sides like this since it would interfere with draft and could result in poor combustion and possibly carbon monoxide poisoning. I converted this tank to electric precisely so I could insulated it well and put it on a timer. For more information on the conversion process read Convert your gas hot water tank to electric. Running the tank on a timer had already reduced its energy consumption considerably. With the additional insulation I was able to reduce “on-time” of the heating element from 6 hours per night to 3 hours per night. It’s currently winter and the garage is cold. Last summer, I operated the tank only 3 hours per night without any additional insulation. I imagine this summer I will be able to reduce the on-time to around 2 hours per night. The heating element is about 520W. The reduction from 6 to 3 hours of operation per night corresponds to a reduction in average power consumption from 130W to 65W, or a savings of 65W. The savings will be less in the summer, since less power is required then anyway, but over an entire year, savings will likely be in the ballpark of 350 kWh or about $24 at $0.07/kWh. I know what you’re thinking. That’s not much, but within the first two years it is enough to pay for the cost of the insulation which validates the above calculations. The savings would be greater if not for the fact that I already modified the tank for high efficiency operation on a timer. Despite appearances, I’m growing fond of my “frankentank”. 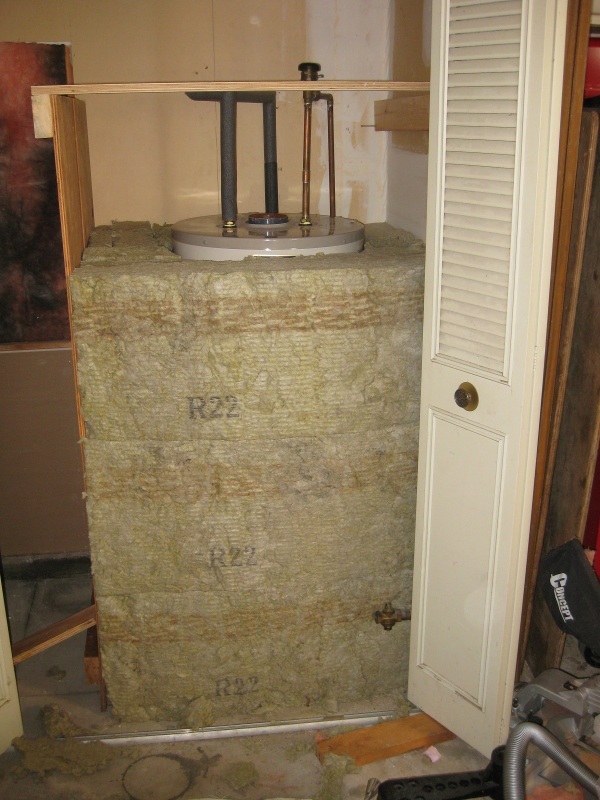 Update (Nov 18, 2009) What about optimum insulation for a house? C represents the cost of the original insulation. Let’s take my home as an example. My walls are 2×4 studs with R13 insulation. My attic is 2×6 joists with R19 insulation (soon to be increased to R47). I estimate the cost of insulation in the walls (including lumber, doors and windows since those costs will all increase to increase the effective insulation thickness) is about $6/m2. I estimate the cost of insulation in my ceiling is about $3.50/m2. My house has a wall area of about 350 m2. The ceiling area is about 200 m2.Â So my total original cost of insulation is C = 350*$6 + 200*$3 = $2700. A is the original cost of heat loss through the insulation per year. I spend about $1100 per year on heating. Of that I expect about $350 is due to air infiltration. Adding more insulation won’t help with that, so my original cost of heat loss through the insulation is A = $1100 – $350 = $750. So based on this formula if I were building my house from scratch and I could wait 25 years for payback, I would do well to make the walls about 7 times thicker than they are and add 7 times more attic insulation than I currently have. That would put the walls at around R90 and the attic at aroundÂ R133. So it looks like my house insulation has MUCH less than a 25 year payback period at today’s heating costs. Perhaps it is closer to a 4 year payback. I suspect that based on fuel prices when the house was built it may have had a 10 year payback. Where I live, the minimum recommended insulation for new construction is for R20 walls and R40 ceilings. Based on my estimates above that might offer around a 10 year payback. The suggested insulation for an energy efficient home is for R40 walls and R60 ceilings. Based on my estimates above that might offer about a 15-20 year payback. From a moral standpoint, the insulation will last the lifetime of the home, so it makes sense to use a payback period equal to the lifetime of the home, even if you don’t expect to live there that long. In that case even the suggested insulation for an energy efficient home seems insufficient since most homes last longer than 20 years. Anyway, I am sure that not all my assumptions are valid. In particular, depending where you live and how well your home is designed for passive solar heating, it’s likely that solar gain may be significant compared to losses into the ground. But I hope I got my main point across: the optimum amount of insulation depends on what payback period you can tolerate. Interesting results. It would be neat to see a similar calculation for the optimum amount of insulation to use when building a house. I bet if you target a 10-15 year payback, it probably makes economic sense to put 1 to 2 ft of insulation in the walls and 2-3 feet of insulation in the attic. Of course the cost calculation would also need to factor in the additional lumber and the reduced square footage of living space due to thicker walls. Great post. Hi Pondered. Thanks for the comment. That is an interesting idea. Depending on the size of the home, the climate, weather-tightness, I think you might find that the optimum insulation thickness is reached more quickly in the case of a home than in the case of a hot water tank. This is because in the case of a home there are some free heat sources: solar gain, occupant body heat, lighting and other electrical appliances. At a certain insulation thickness, the cost of heating will drop to zero. I haven’t done the math to figure out what that thickness might be for a typical home, but I do recall reading an article about a person in eastern Canada who built a passively heated solar home with 11″ of insulation in the walls and he found he paid $200-$300 in heating bills per year. He built his walls as a 2×6 framed inner wall and another 2×6 framed outer wall, with the studs out of phase. He also used a continuous, unbroken vapor barrier between the two walls, with all electrical and plumbing routed on the inside of the vapor barrier, resulting in an extremely well sealed building envelope. very interesting info here, i am always in favor of messing with basic and mass products to maximize gain and efficiencies. The transformation of the gas heater sounds quite rigged tho, i am not sure if i would be comfortable with a bent up old element as my heating element which may short out on the inside of the tank. Also if you super insulate a gas hot water tank, care must be taken to not impede the air intake and outlet where heat and flame may pose a fire hazard. i in the past superinsulated a very small electrical tank and it used next to NO power at all. I used a vapor barrier and cardboard to hold the insulation reasonably consistently around the tank. Cardboard makes a wonderfully fitting cover for the insulation batts but again, watch the flame/fire hazard. Nice work, impressive and highly useful for those of us able to rig things, kinda dangerous for some who THINK they are Mr. Fix-it’s tho, lousy craftsmen, keep clear and don’t burn down your families!! Admit if you are NOT that guy and keep safe. Thanks for pursuing this info at a time critical for our planet to reduce energy consumption, wake up North America, it’s time to do this type of stuff!! The bent element is surprisingly robust. I think if you experienced the bending process and held the final result in your hands you would have more confidence in it. The likelihood of a short seems no greater than in it’s original application as a stove element. Steel pots are used on these elements all the time, with a danger of electrocution to any person touching the pot if the element ever shorted out so I think these elements are designed to be quite safe in that regard. I don’t recommend super-insulating a gas hot water tank (with open flue) unless you first convert it to electric and cap the flue as I did. The dangers are much greater (explosion, fire and carbon monoxide poisoning) with a gas tank, and the gains from adding insulation are much less since several hundred watts are dissipated into the tube at the center of the tank and up the chimney regardless of how much you insulate the outside of the tank. This loss cannot be eliminated without capping the tank (which cannot be done safely while it is operating on gas). Do you know of any similar tests for wall insulation? I want to build a new house with 10″ think walls and as much insulation as I can get. My assumption is that a well insulated wall and ceiling will pay for itself in low heating / cooling costs and inert insulation requires no maintenance during the life of the house. My builder ( and several friends) say that insulation will only go so far. Once you have insulated to around R 40 in the ceiling and R20 in the walls, you loose any advantage. That does not make sense to me. But does anyone actually know the optimum amount of insulation to install? You’re right to question your friends and builder. 10″ walls will definitely reduce energy consumption. It’s just a question of how long it will take for the additional cost of insulating to be payed back in reduced energy costs. Because insulation lasts for the lifetime of the home, the “moral” choice is to design for a payback period equal to the lifetime of the home. I don’t know for certain, but based on my calculations it seems that recommended R-Values (R20 walls and R40 ceilings) are based on about a 20 year payback. If you expect your home to last 40 years or more, you could double the recommended R-values and still achieve payback over the lifetime of your home. I added some more information to the original article since a couple people have asked about home insulation. Thanks for your comment. There are a few other factors to consider.If you are in a climate where you use the heat more than the air- I refer to actual balance of heat- not time. you are not saving as much. Also, depending on if your heat system is an exchange system or pure electric. In a house with heat strip heating and electric heater(and heater is running), you save almost nothing as long as airflow is good and the WH is not up against an outside wall. I live in FL so, insulation helps in 2 ways- lower water heater cost and lower cost on A/C since it does not have to cool the extra air the WH is heating. I have a heat exchanger that gets the water hotter than the electric as long as the air is on . The WH is unplugged 8 months of the year and the water is super hot all summer. The water(even at 120)is able to remove much more heat than the 95 degree air outside, which in turn lowers the A/C portion of the bill! Super-insulate the home enough such that the capital cost of the heating/cooling equipment is drastically reduced. If you don’t need a heater/cooler, you can save thousands on capital cost and instead ‘pipe’ it into insulation costs. The best news is that there is no running cost for insulation. I’m in the market for a new hot water tank, and would like to switch from propane to electric so that I can not only super-insulate, but also preheat with solar. I have tons of sun shine almost year round, and my chief goal would be to be able to keep that water hot enough throughout the night as to be able to shower in the morning, and replenish the tank with hot water from the roof during daylight hours (still in the planning stages, though). Thanks for documenting all of this. I inherited an 80 gallon electric hot water tank when I bought my house (in your general area, specifically, Seattle). Sounds like you’ve seen the inside of a hot water tank, so I’d like your opinion regarding what would be involved in converting this tank to a 50 gallon capacity, which is all my wife and I probably need. My guess is I’d simply have to disable the top heating element (leaving the bottom one enabled), and install a new water-level sensing switch to cause filling to stop at the desired height. What do you think? There is no water level sensing switch in a hot water tank. The tank is always completely full of water, so modifying it as you described is not possible. A compairson would be awesome. First year you put on a KWh mesurement thingie on the powerplug, and a KWh mesurement on the wateroutput aswell. Then from januar 1’st to januar1’st you can see the input/output and the loss of the tank. Would be nice to actuarly see numbers. I think you need to check your numbers. If your attic is 200 m2, which is reasonable, then your walls must be approximately 14m on a side or a total of 56 linear m. If you have 1200m2 of wall area, your house is 21m high or 7 stories. But remember insulating your hot water tank alot will make the wires inside the tank get HOT and could cause a fire!!! @ Noirceuil, Thanks for being on the ball and checking my numbers. You are absolutely right. I’ve updated the post with a wall area of 350m^2 (60m perimeter by a little under 6m high). The new results suggest much more insulation is worthwhile. Thanks again. As far as I know there are some considerations when insulating pipes. Basically as the diameter of the insulation increases the outer surface also increases which means there may be some point at whith the insulation is counter efective :). That also means that for very small diameter pipes no insulation is the best solution. When I have first heard that it sounded very unintuitive, but then I have found some information about that on the internet. Thanks for the interesting article. I will have to think about it more. Frequently when reading references to adding insulation to a water heater, the first step is “put your hand on it and see if it is warm”. If it is, further insulation is of no value. I usually stop at that point, but now I’m wondering if that is bad information. (my water heater is an 80 gallon one, in a somewhat heated basement. It actually feels cool to the touch, so seems unlikely it is losing much heat thru the walls. Oh, I have the water temp set to the lowest, about 120 degrees, and the heater was a more efficient one 12 years ago when I purchased it. Due to be replaced within a few years.) One nuisance with being scientific with a water heater is that it isn’t easy to see how many watts it is using; can’t plug it into my Kill-a-watt. Oh, I can provide some info on superinsulating a house. I can’t provide any calculations, but suspect your figures of R80 walls and R133 ceilings are excessive. (perhaps look at passivehouses, I think they use less insulation and still require no heating input) I would guess more like R60 and R80 would be cost effective. Also, I just scanned your calculations, suspect you didn’t add in costs for materials to contain/support the insulation. Guess it depends on what material you use, cellulose would require a wall, maybe foam wouldn’t. I speak from some experience here, I built a double wall superinsulated house in 1984, and have been living there since then. But mistakes were made, I’m still trying to improve things. I used two 2×4 walls, set about six inches apart. Fiberglass insulation batts, let’s see, it must be about R45 (R13 + R19+R13). There is a continuous vapor barrier just outside the inner wall. At least it was continuous when installed, seems like I have been punching holes thru it for 25 years. Ceiling is about R60, fiberglas attic batts topped with several inches of cellulose. Wall thickness is a good/bad item. Our windows are set at the outside, so we have big windowsills (about ten inches). Nice to put plants on, etc. But if you are off to the side of a window, your view is reduced due to their thickness. I can’t report good numbers on my house. I had actually hoped it would be passive, not needing any heat. But it was built over time, so for the first 15 years we didn’t have the inner wall insulated (nor drywall). We started with a woodstove heater, but grew tired of coming home to a cold house. Eventually installed a geothermal waterfurnace. The house has consistently used more energy to heat than calculations predicted. (In Michigan, we thought it would be ~$200 per winter) Again, this is hard to calculate, since all the electrical use is lumped together, maybe it is using $900 per winter, with today’s electric rates. Our biggest current problem is raccoons. They have busted thru my cedar siding in several spots, and nest in the cavity between the two walls. Packing down much of the fiberglas batts. Trying to decide what to blow in there (InsulCrete or Retrofoam or ?) to fix that problem. Back to your R80/R133 insulation levels: you might find cooling would be a problem at that level. We never used to be AC people, but since the waterfurnace included that, we have become somewhat hooked. (also, seems like summers have become hotter, and there is this aging thing, seems like the heat affects you more…) On one hand, more insulation means your AC can run less for the same cooling. On the other hand, TV’s, fridges, etc put out a fair amount of heat. Solar gain thru the windows in the morning/evenings mean you have to adjust shades so the house doesn’t warm up as fast. To conclude these ramblings: a friend build a superinsulated house in 2000. He used ICFs (insulating concrete forms). I would heartily recommend that over my system. I think the thickest ones are 12″, whatever R factor that gives is probably a fair tradeoff for Michigan. Sorry, long post, and of course I don’t see the typo until I submit…. You are probably right about the house insulation calculations. As indicated in the post, I made some big assumptions to simplify the math. Consider the heat path, and temperatures along it. Tw is the interior water temperature. Ts is the surface temperature. Tair is the ambient air temperature. The thermal resistance between Tw and Ts (the existing tank insulation) is very high compared to the thermal resistance between Ts and Tair (just a thin boundary layer of air). The result will be that Ts is much nearer to Tair than it is to Tw, even though a significant amount of heat may be flowing through the wall. In plain English, any heat that comes through the wall is immediately dissipated to the air, so the surface temperature will not be much warmer than the ambient air temperature. There is also the issue that a metal surface usually feels cool to the touch because metal conducts heat so well. If you use an infrared thermometer you will find that a metal surface that feels cool to the touch may actually be many degrees above ambient temperature. Theory aside, I can say from experience that my tank felt cool to the touch before I added extra insulation, but when I slide my hand in between the tank and the exterior insulation now it feels VERY warm to the touch. All of the heat that is now so easily detectable was simply escaping to the air before. Rob, thanks for the response. I’m going to check into this further. Someone else mentioned that waterheatertimer.org site, I was looking that over, too. They also suggested putting a thermometer on the tank, then covering it with insulation to evaluate. I’ll also check it with an infrared thermometer. I did notice that my pressure valve was very warm at the top, so at least I can add some insulation there. Since my water heater is on borrowed time, I probably won’t do much with the current one. I am going to convert oil to gas and my contractor recommend indirect gas water heater. I decided to stay put with my electric water heater since it still good. I was thinking about to insulated the tank and adding the timer. Seeing your post and pictures which is the great idea. But, is it ok to wrap the whole tank like that? I’m sured it’s ok since you did it. Also, I have some attic insulation that I pick up from freecycle, is it ok to use them? I know it’s a stupid question but I’m only single mom who know nothing about anything but try to save money. Thank for your help. It’s perfectly fine to wrap an electric tank completely like that. Attic insulation should be fine. It’s a good precaution not to wrap anything flammable around electric appliances. If it’s fiberglass or rock wool it should be fine. Whatever it is you can try burning a small piece with a match or lighter to confirm. Good luck. Thank you, Rob. I’m glad that I found your website. Very good and useful information. Amazing. I’ve searched high and low for something like this, and on a fluke web search (“insulate water heater with batts”) I finally found this article. I’ve already planned out almost the same exact thing. I’m going to be using Roxul as well. I’ve built a wood platform so I can stick several inches of insulation under the water heater, and I’m going to use Roxul to insulate the water pipes too. Since the Roxul is so thick, it can even completely envelop the TPR valve while providing an empty space for the lever to safely operate. It’s just baffling to me why people obsess over building energy efficiency, but when it comes to water heaters, they just shrug and say “it doesn’t feel warm, so there’s no point in adding more insulation.” Simple math can easily show this to not be true. No one does a “warm to the touch” test in an attic or on a wall, because it is unscientific and ineffective. Since water heating is the #2 energy use in most homes, doing the math matters. The savings is more modest than insulating your attic, but it’s also much cheaper and easier to do. I think modern water heaters usually have 1-2 inches of polyurethane insulation, giving an R-value of 6-15 or so (calculating R-value on a cylinder is complicated). This would be considered pathetic in an attic, and mediocre in a wall. By my back-of-the-envelope math, adding about 8 inches of Roxul around the water heater would save me about $15/yr with an electric water heater (COP=~.95), but I have a heat pump water heater (COP=~2.5) so the savings will be much less. It’ll take 10+, maybe 20+ years to recoup, but since most people have plain electric water heaters, they could recoup the costs in 5 years or less. I don’t see why this isn’t more widespread. It’s cheap, easy, and is a foolproof investment. Regarding pipe insulation, the typical stuff is R-2. If you look around, you can find R-4. If you REALLY look hard, you can track down some that’s about R-8 (Thermacel 1″ wall on Grainger, item numbers: 2CKN1 2CKN2 2CKN3 2CKN5 2CKL9). But why stop at R-8? You can add more R-value for cheaper by slicing Roxul up into long rectangles that you fit around the pipes. Obviously this won’t work in some cramped areas, but in many houses, the majority of pipe has several inches of open space around it, except where it crosses joists. I think your first formula is wrong. The cost of insulation is just CF, not CF/T. This makes sense because the cost of the insulation you buy should not depend on the thickness of the original insulation. If I go to Home Depot and buy some fiberglass batting, the cashier doesn’t ask me how much insulation I have at home. This is also apparent by looking at units. The cost of insulation should have units of currency (dollars in this case). F is the thickness of insulation and has units of length (cm in this case). C is the cost of insulation PER thickness, and has units of currency per length (dollars/cm in this case). Your error propagates down in your calculation, so you should have F = YA/C – T, not F = YAT/C – T.
YA/C has units of [time]*[currency/time]/[currency/length] = length. Both F and T have units of [length]. Your formula has [time]*[currency/time]*[length]/[currency/length] = 1 (dimensionless), which you set equal to [length]. If you still don’t believe me, check a few values. Suppose you’ve already super-insulated, and have T = 100 cm. What would the payback time be for adding another 5 cm? You wouldn’t expect to make your money up very quickly since you’re barely changing things. To get the payback time for a given insulation upgrade, solve for Y = (F+T)C/A in my case, or Y = (F+T)C/(AT) in yours. For F = 5 cm, T = 100 cm, C = $20/cm, and A = $100/year. In my case, Y = 21 years. In your case, Y = 0.21 years. Additionally, the water heater is cylindrical, meaning that the circumference grows with insulation amount, but you get the basic idea. I think you misunderstood my definition of C.
C is the “cost of adding T cm of insulation”. Yes, T is the original insulation thickness, but in this case I am saying C is what it would cost to add T more cm of insulation. It is an arbitrary choice for convenience. I could have said C is the cost of adding 1cm of insulation in which case C would be $/cm as you assumed. But as I have defined C, it is NOT the cost PER thickness. It is the absolute cost of a specified thickness (T). C has units of $ (as indicated in brackets in my definition), not $/cm. To get $/cm you need to divide by the thickness (T) that C is the cost of. Thus C/T is the cost per thickness in $/cm and C/T * F is the cost of adding thickness F. C/T * F has units of $, just like we want. In your example (adding 5cm of insulation to 100cm), if C is $20 (which is probably lower than you’d actually pay to add over 3ft of insulation), then the cost per unit thickness C/T is only $0.20/cm. Adding 5cm costs only $1 but will in theory reduce operating costs by about 5% (the percentage increase in insulation thickness) saving about $5 per year on the current $100/yr operating cost. Spending $1 to save $5 per year has a payback of about 0.2 years. So the formula makes sense as long a you recognize that C is in $, not $/cm. You are correct that the water heater is cylindrical and to keep things simple I have not accounted for the increasing circumference as the insulation thickness grows. I’ve assumed that most people will not be adding so much insulation that this has a significant effect on the results. For typical changes in thickness (say just doubling or tripling the original thickness), the formula given should be a good approximation. I just ran across this web site, Very interesting. Last year the company I work for replaced the roof, removing a lot of polystyrene insulation. I grabbed all I could! I build a 16 x 16 shop building using 8″ x 4’x10′ sip’s. I got these on the cheap. 50$ each. I split these in half, then built up the wall to 7′ stick framing. Then filled in the cavity’s with the polystyrene. The floor is 9″ I joists, the roof is 6″ all cavity’s filled with the poly. I built the roof cathedral for windows up top and to give a feeling of more space. The wife and granddaughter came out to shop the other week, within 15 min it started getting hot with the three of us in there! I’m sold on SIP’s my next house will be built using these. My little shop was a test bed and I love it! We’re doing a huge remodel on the house we have now. I’m using the poly sheets to insulate the walls and ceilings, maybe the roof if I have enough. 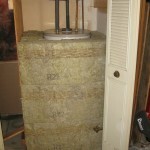 Great article, however you are missing a very important element when it comes to insulation. As you increase insulation thickness on a flat surface of given area A the resistance to heat transfer increases, as expected and the heat lost to convection from the outside of the insulation remains the same. However with a cylinder such as a tank, as you increase the radius of the insulation the surface area rises, and you will reach a point where the loss from convection actually increases to above the savings from thicker insulation. This is known as the critical radius and can be calculated by simply taking K the thermal conductivity coefficient of the insulation, and the convection coefficient for air. Rcritical = K/H this gives you the optimal thickness for insulation. anything above this and you are actually giving away your gains. Thanks for your comment. I partly agree. I know my assumption that doubling the insulation thickness will half the heat transfer is technically not accurate for a cylinder. I made that simplification to make the math easier and more understandable. It is a reasonable approximation when the starting radius of the uninsulated tank is well above the “critical radius” and the thickness of insulation added is less than the starting radius. Perhaps the formula is off by a factor of 2. I suspect my estimation of reasonable values to put into the formula may be off by at least that much as well. I’m not launching a space shuttle… I’m just doing some rough estimation. While I agree it would be more accurate to consider convection effects from increasing the surface area, I disagree with your understanding of the term “critical radius”. Critical radius is the radius BELOW which, adding insulation will decrease thermal resistance rather than increase it. If the radius starts of an uninsulated cylinder starts out less than the critical radius, then insulating the cylinder or pipe will initially decrease the thermal resistance. After adding enough insulation to reach the critical radius, adding more insulation will again increase the thermal resistance. But if the radius of the uninsulated cylinder is already greater than the critical radius, then adding insulation will always increase the thermal resistance. In my case, K is perhaps 0.04 W/m/K and H is perhaps 20 W/m^2/K. Thus the critical radius K/H is about 2mm. I can assure you that the radius of my hot water tank is significantly greater than that ;-). Thus adding more insulation will always increase the thermal resistance and decrease the heat transfer. There is no point at which adding more insulation will cause increased heat transfer. However, there is definitely a point at which the cost of adding more insulation will exceed the energy savings within a desired payback period. Overall a Nice and good read regarding the value of adding additional insulation to a water heater, let alone all the science behind insulation. I am impressed that you still personally respond to posts over the span of years. Let alone all the time, effort and cost to help out your fellow men and women. Thank you! I would like to add to the pot o knowledge with what little I know about water heaters. 1) don’t bother converting a gas water heater to electric water heater as in my humble opinion there are too many design differences regarding heat transfer and fluid flow between gas and electric water heaters. Significant heat transfer and efficiency will likely be lost. However, insulating to the extreme as described will likely reduce these concerns. 2) I noted that both the cold and hot water lines going into the water heater (before insulation mod) did not have dielectric connections from the copper pipes connecting to the water heater. This means that galvanic corrosion (two dissimilar metals in direct electrical contact) will occur immediately after the water heater plumbing lines are connected to the water heater. What this means to the home owner is that the zinc sacrificial anode installed on the top of all water heaters will continue to do its job for a year or so or maybe longer (conveniently beyond warranty) and you will be faced with having to replace your water heater significantly earlier than you would have had to otherwise (I think this is the best $10 you can spend and you can also negate the 3 bucks you spent on the copper fittings you won’t have to spend). Failure of the water heater will likely to occur years [yes years] earlier than had dielectric connections been installed at the water heater to inlet/outlet pipe interface. No need to factor in replacement of a water heater since this website was based on benefits of installing additional exterior insulation. Oh the Zinc sacrificial anode is replaceable, However, your going to need a damn good big pipe wrench or giant pipe wrench to replace the zinc sacrificial anode. installed anodes are generally real long (pull it out till it hits the sealing) then either bend it or cut it to get it out. Replacement Zinc anodes are segmented in 6″ or longer lengths (won’t have to bust out your ceiling or radically bend the anode rod). 3) I noted on the 3 images that there were no thermal heat traps? So what is a thermal heat trap? 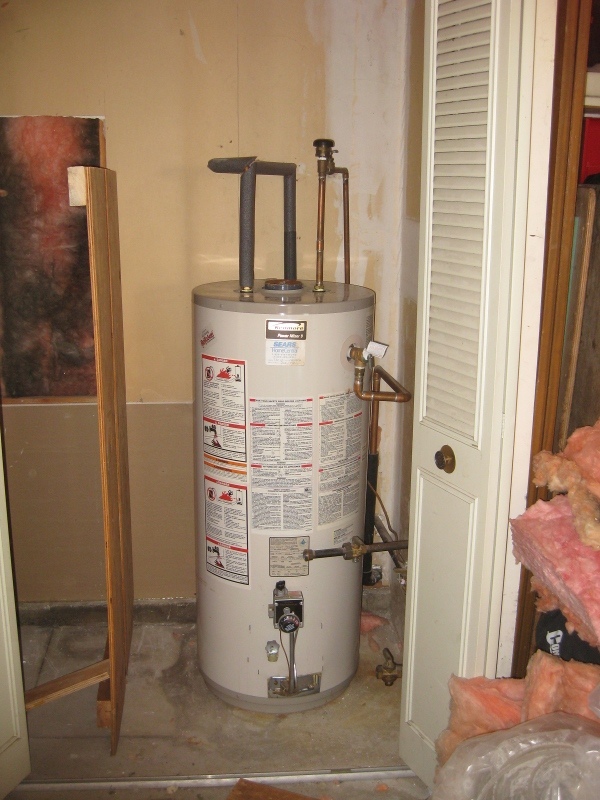 Well, as in the majority of hot water heater installations both the cold and hot water lines connected to the top of the water heater go directly upward in direction and then horizontally before they disappear into the wall before they meet the sheet rock. Then they generally always (inside the wall) travel upward and are distributed throughout the hot water sources throughout the house. Well heat rises and the water and piping acts like a heat conduit and dissipates this heat in the piping beyond where it dissappears into the wall like a big radiator. A heat trap is simply rerouting the the piping (as close as practical to the water heater) to go down 6 or 8 inches before turning back upward to connect to the existing house piping. You don’t see heat traps very often because they take more than 15 minutes to install (all the cutting and brazing and all). Yes external insulation has significant value and should be installed. I believe that thermal heat traps alone will negate and exceed the benefits of 500,523.23 feet of external insulation. Just an over exaggeration to exemplify the importance of heat traps. So the question comes to mind, why are thermal heat traps so uncommon and why are water heaters under insulated? But you already know the answer. It is all about money. Why spend a few bucks more$ plus labor $$ when you don’t have to when it comes to raking a home owner over the coals. To be frank (no im not Frank I’m Tim), I imagine If I were water heater boy and replaced water heaters as a living (my own company) I would install the thermal heat traps and offer exterior insulation for the first couple years of my business, but then lets face it, kids soccer games, commitments, competition from other water heater boys I sure as heck would abandon pursuing the ideal installation. Cost of living keeps going up. Heck I would also giving up sweating fittings, why not use flexible connections, that way I can get multiple water heaters done in less time (if business that day is good) besides there cheap and way quicker. In summary: #1 Install dielectric connections at the water heaters (cheap), Install heat traps (also cheap), Insulate your water heater including inlet and outlet lines and the thermal/pressure relief valve and thermal/pressure relief valve tail pipe (just a foot or so, use your hand you will feel the warmth in the pipe, just go a foot or so further. I like the water heater fiber insulation with aluminum foil exterior with aluminum tape just because when your done your water heater will look like it belongs on the international space station. Also consider a water heater pan with 1″ drain line to outside your residence. 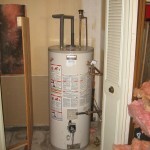 If your water heater is located inside the house than consider it mandatory. Can you imagine the financial impact of a leaking water heater when you are away? Generally when a leak develops they are slow <gal per hour then rapidly increase over a few days (but who cares about normal water heater failure symptoms). Also consider using unions on the connections to your water heater. They will cause the foam insulation to bulge out (your going to insulate your lines aren't you?) so it won't look as pretty, but sure makes the next water heater change out allot easier. Unions are kinda pricey they were around 7 bucks each as I recall at the box stores. Oh as a side note. If your ever faced with deciding which water heater to purchase (home depot, lowes or sears for example) and they got it configured good, better or best. You will rationalize (after much mental anguish) to go in the middle and get the "Better" water heater (not saying your a cheapskate, that's why you pick the better after all). I guarantee that sure enough 2 weeks after you get your water heater your neighbors water heater will go out and he will get the "Best" water heater. When you see his water heater, and compare it to yours, then your gonna get bummed out cuz there is a significant difference (powder coated finish, Brass drain valve instead of plastic, etc.). So if you can't lay your eye balls on the water heater (cuz there all in boxes, except what's displayed) then go with the best (unless there is a significant cost difference to compel you to go with the "better" branded water heater). Oh if your doing it yourself, then always get fresh lead free flux. I have beat my brains out over crappy brazed fittings due to old or contaminated flux. During the summer you get free solar heat gain through the windows. The older and less efficient they are the more heat gain you get. As you superinsulate a house that heat gain gets trapped in the home. So if you have lots of windows or even an average amount of windows especially ones facing south or west you will get solar heat gain and it will get trapped in your superinsulated house increasing your cooling costs. My house is built to code (WA state energy code) and I have west facing windows. The result is that the AC will run until mid October if I don’t open the windows. The nice thing is that I can easily open the windows when I’m home and get 50 degree air for free. Where air comes to burners?? According to codes there should be air coming both to bottom and top of water heater for proper combustion. I don’t see any way the air can come to bottom burners? There is no burner. The tank was converted from gas to electric. This is explained in the article directly beneath the photos. From Australia so figures are all different! I have an 80 litre electric tank in an enclosed but large foundation 3.0m high under my apartment. A few years ago I covered the tank in R4 polyester batts (equal to roughly R22), with 2 layers of R4 on top of the tank. Then I covered the whole thing in building bubble wrap, leaving access for the electric connection access panel (& also so it does not over heat). Also access to the pressure release valve. Building bubble wrap only under the tank which is sitting on a precast concrete tile, then sitting on the ground. Air movement is extremely low. Ambient temperature under the above floor 22.8°C (pretty stable around the year at roughly 5°C variation in the foundations), a few cm off the ground (dirt) 22.7°C, foundation height 3.0 metres. Ambient temperature on top of all the tank insulation 23.1°C in the centre of the tank, directly on top the building bubble wrap cover! The top of the tank under the insulation is 45.3°C in the centre of the tank. At the top edge of the tank 42.6°C. Half way down the tank 37.3°C. At the water outlet 52.5°C which is also insulated and then has a 30cm heat trap. Tank is set to 65°C as required in Australia. Water exiting release valve 64.1°C with the Engel thermometer stuck up the pipe at far as possible, it stopped at the release valve! As far a cost, the materials were basically leftovers, so rather than throw the insulation out, I covered the tank. The tank has to comply with a maximum 1.67 kW loss of heat per 24 hours. So if it is 45°C under the additional insulation I should be saving something. Not that I am that good with numbers, but I am sure it is a few cappuccinos a year! Thank you for the data & the simple idea of adding insulation. You’re mistaken about the efficiency of heat transfer from a solid (or liquid) to air. Go stand outside on a 40 degree day with normal clothes on and time how long it takes you to become unbearably cold. Repeat this in a 40 degree swimming pool. The heat will build up in the solid wall of the tank and slowly leak to the air, but not quickly enough to keep the tank at ambient air temps. You should study heat transfer. And stop making statements before you check your facts. I’m not certain what statements of mine you’re referring to that you believe to be mistaken. I agree with what you’ve said and don’t see a conflict between it and any statements I’ve made. If there’s a specific statement of mine you disagree with, please quote it. If I’m mistaken then I’m interested in learning. If I simply wasn’t clear enough, then I’m interested in explaining myself better. PS. I find that what someone has studied is often not indicative of what they have learned/understood. But since you brought it up, I have studied heat transfer. You raise a fascinating question regarding critical radius as it relates to surface area of a water tank’s loss of temperature. If I am padding a tank with insulation, doesn’t the benefit infinitely gain advantage over heat loss since the spatial radius is effectively existing in an atmosphere that is commonly of a much lower temperature than the heated water? Very good discussion with people much better than numbers than I, but appreciated all the more! We recently did a “big push” on our reno of a 1913 home – 15 years so far – from re-pointing the limestone boulder foundation, to wrapping the home with 2″ of rigid insulation, to the roof. Luckily the “big push” included a new kitchen and bathroom so I probably bought another couple years with the wife haha! I recently purchased and installed a Sense Home Energy Monitoring system and can now see amazing detail as to all my home’s electrical consumption. The heating of stored hot water has irked me for sometime and I’ve considered an “on-demand” unit but from what I’ve read the cons are undeniable (unless you have warmer ground water than here in Central Canada which is usually below 10*C). My original plan was to install a copper heat recovery coil on the plumbing drain stack and use a salvaged HWT to store water closer to room temperature before the “secondary-primary” HWT. Then I read about mold propagating in cooler temperature water so it’s back to what can I do closer to “conventional”. Perhaps luckily I like to take some time with my ideas before I implement them haha. Great idea about using large format, non-combustible insulation on an electric HWT. I’ve got a foil “bubble wrap” insulation kit form HD on there now but the Roxul should work great. I’ve also considered a heat pump HWT but the basement where it’s located is always cool so that’s seems redundant. The “heat traps” on the inlet/outlet mentioned are interesting. My plumbing is all PEX now, but I imagine without the copper, the concept is the same and I will install those. As far as insulating the outlet lines, is there a “practical” distance to insulate coming away from the tank? The “dielectric” connections mentioned in one post (meant to maximize the life of the sacrificial anode) – is this only applicable with copper plumbing? Although I have only had the Sense Energy Monitor running for a week and a half (it takes quite a few weeks for it to process all the electrical algorithms of your individual loads), my first impression is that I would highly recommend it (to those interested in such things). I am, but ultimately I got it because after our big reno “push” our electric bills increased considerably. Either we introduced way more electrical loads than we were accustomed to, or I feared something was wrong somewhere either with the wiring or an appliance. Having now monitored my complete electrical consumption for a mere week and a half, it is most likely that we have considerably more circuits in our 1913 home. That being said, knowledge is power. And I like knowledge. There is an element missing from your house insulation calculations. You need a discount rate for the cost when you are using such long timeframes. This is because of the “Time value of money”. Inflation and opportunity costs mean that money spent now is worth more in the future, so we usually apply an annual percentage increase. Otherwise what looks like a 25 year payback might actually be much longer or never pay back. I can see you are adept with excel, so I would suggest you employ the Present value (PV) function. Of course different people have different discount rates depending what opportunities are available to them, but I’m assuming that most people’s discount rate is equivalent to savings account interest (currently about 1% but has been up to 4-5% in the past 20 years). I think it is reasonable to assume that heating costs (ex cost per kWh) are rising at about the same rate. So while $1 today will be worth $1.50 at some future date, it’s a fair assumption that at such future date it won’t be worth any more kWh of heating energy than it is today. I hope that makes sense. Cheers. A few notes to add to my December 7, 2016 post. I have had the chance to test the 80L hot water tank with everything else turned off at the meter & no water use, during our typical mild Sydney winter over 3 days. The foundations were 15°C over each of the 3 days. It was down to about 7°C outside in the morning & about 18°C early afternoon. The tank heat loss just scraped in under 1.0kWh per 24 hours. The pipes in and out are also insulated with the first section to the heat trap with a bit more insulation. Still a little warm outside the insulation in this area, so a few minor improvements could be made here. The tank only, under ideal lab circumstances with no connected pipes is designed to loose no more than 1.67 kWh per 24 hours at I believe 20°C ambient temperature. So 1.0kWh over 24 hours at 15°C ambient temperature I think is fairly reasonable. We have had another round of massive electricity price increases and there doesn’t seem to be any end to price increases over the foreseeable future. As I previously mentioned the insulation was leftovers so it was not much more effort putting it around the tank instead of putting it in the bin! Once again thank you for the idea, much appreciated. The “tank” is not where most of the heat is lost. Heat is lost, mostly, through the “lines”. Heat travels quite well, through water. The lines entering and exiting the tank, including the drain-line, is where the majority of heat is lost. You need that “distance”, within the plastic lines, to reduce the time that it takes for the heat to travel out to the uninsulated pipes. However, because your fresh-water inlet is always “cold/cool”, the tank will constantly be cooling when you use the cold water. You are wasting power to heat the cold line, up to the point where the junction splits to deliver water to your hot-water tank. To find your heat-losses, you can simply feel the connections. If they are not cold, like the point where water is entering your house, then they are being heated by the thermal transfer through the water. I’m not sure if someone mentioned it; while it is correct that if your water heater is in a heated space you will only save energy in summer one might want to add; you likely loose twice of that energy in summer than you would if it was not in a heated area; once to keep the water warm and than also your AC will run more to keep it cool!